In the spring of 2006, the TMF launched its own book series on telematics in medical research with the publication of the generic data protection concepts. The results from the TMF projects as well as reference works on telematics in medical research are published by the German medical scientific publishing company MWV. On publication of its results, the TMF, amongst other things, makes checklists, training documentation and legal expert opinions available, which are of substantial value for practical work in networked medical research projects. The volumes of the TMF book series are only available in German language. As society is increasingly moving towards more transparency and participation, communication processes in health research grow in importance. A trustful relationship between research organisations and their different stakeholders is key and needs to be cultivated continually. This anthology provides expert experience and ideas about designing communication strategies and processes in health research. Aspects covered are strategy development, the relationship between science and media, providing evidence-based information for patients, issues of organisational communication, stakeholder engagement and fundraising. This book mirrors the activities and trainings organised by the TMF working group science communication during the past couple of years. The working group is a forum to discuss the latest developments in science communication and organisational communication relevant to health research organisations. Exchanging and utilising data across a broad variety of IT systems is a necessity that creates considerable challenges for medical research and patient care. Interoperability is key – for communicating data both accurately and understandably. But to ensure IT systems consistently and correctly interpret the information they receive, syntactic and semantic standardisation is essential. 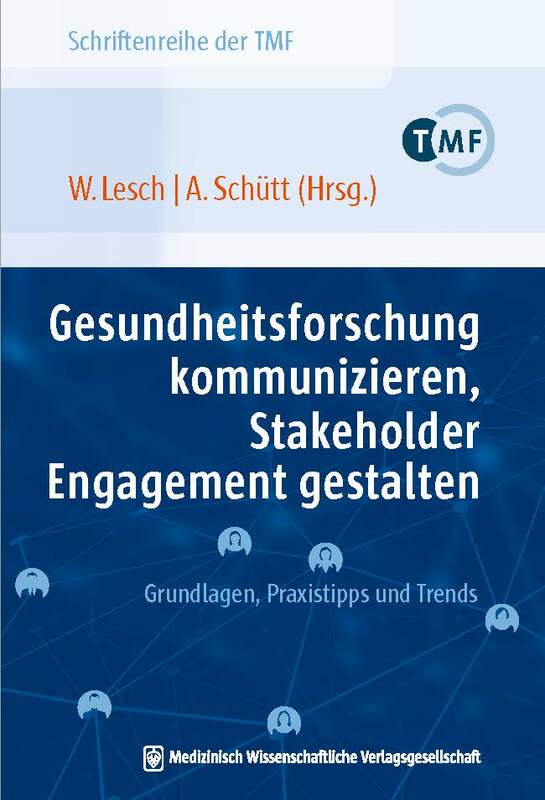 Against this background, the 13th volume in the TMF book series, Terminologien und Ordnungssysteme in der Medizin − Standortbestimmung und Handlungsbedarf in den deutschsprachigen Ländern (Terminology and Classification Systems in Medicine – The Current Situation and Need for Action and Agreement in the German-Speaking World, available in German only) investigates and compiles information on current terminology usage in German-speaking (DACH) countries, with the goal of formulating a standardised approach. This edited publication is the result of a pilot study on terminology and classification systems funded by the German Federal Ministry of Health. A number of actors from Germany, Austria and Switzerland (the DACH countries), took part in expert workshops that used chosen scenarios (patient care summaries, medication records and an electronic notification system for infectious diseases) to assess terminology usage in the German-speaking world. Increasingly, clinical data gained within the context of patient treatment is being harnessed for research and quality assurance in healthcare. Systematic analysis of this data offers new insights that would not be possible, or only with considerable effort and expense, with data generated primarily for research alone. However, the legislation governing secondary use in Germany is extremely complex, and can vary significantly depending upon the location and type of facility involved, and the purpose of usage. TMF has published a guide that describes in detail the legal framework for each specific situation. Moreover, the hardcopy book is supported by an online tool that facilitates searches. Fostering medical progress and assuring high-quality treatments is no longer possible without the long-term storage and analysis of clinical data and biological samples. Against this background, sustainable data protection concepts are becoming ever-more important. They are key to gaining the trust of patients and donors – an essential element of medical research projects. For many years, TMF’s generic data privacy concepts have formed a foundation for planning and implementing projects involving the collection of data and samples for long-term use in medical research projects. The documentation, first published in 2003 and 2006 and approved by the association of data protection officers, not only provides concrete solutions but also encourages dialogue between researchers and data privacy experts. A common language and open expression of both parties’ aims has led to significant shortening of approval processes – saving time and effort for all those involved. TMF’s data protection work group has advised more than 80 research projects on the design and implementation of data privacy documentation and is, increasingly, a central point of contact for questions relating to the topic. The new edited concepts draw on this rich experience. They provide proven advice on the technical and organisational roll-out of data protection principles. And thanks to their modular structure, they are now suitable for a broader range of application scenarios. Drug trials, benefit analyses and epidemiological trials play an important role in evidence-based decisions within the healthcare system. Data is the foundation of all of these assets. And the quality of this data is becoming increasingly important, not only to the scientists themselves, but also in the politics of healthcare. TMF has revised its guide to managing data quality in medical research, providing up-to-date advice and assistance on the topic. The publication defines a systematic approach to managing data quality, provides a broad range of quality indicators and highlights specific use cases. It is aimed at people responsible for data management and quality assurance in cohort studies and registries as well as project leaders. In addition, healthcare data and research based on clinical evaluations can also be enhanced using the insights in the book. Infectious pathogens that are transmitted from animals to humans and can cause so-called zoonoses are the subject of numerous research projects. To be able to better understand, combat and monitor these pathogens, samples are taken from animals for the purpose of scientific investigations. In this field, legal and data protection issues arise which are the subject of the expertise. It was prepared on the initiative of the National Research Platform for Zoonoses and its purpose is to give researchers legal certainty for taking and processing animal samples, for compiling research information, and for obtaining informed consent declarations. In order to sensitize researchers to the legal context in which they are operating the book explains what legal issues are involved in scientifically relevant sample-taking scenarios and in the further processing of data accompanying the samples. Topics range from the obligation to notify and report animal epidemics to the rights of use and exploitation in the samples. At www.zoonosen.net there are also specimen texts concerning research information and informed consent declarations available for downloading free of charge. Genetic association studies have been performed with high-throughput methods relatively successfully for some time now. Such methods are based on the application of highly integrated, extremely powerful microarray technologies, which, however, involve a number of practical problems. Error sources result along the entire processing chain so the qualitative genotyping data generated is not completely reliable. Now that this book has been published there are widely agreed recommendations available on the quality assurance of data that is generated by high-throughput genotyping. The issues dealt with range from problems concerning validity and plausibility, identification and avoidance of errors, to requirements for data management and data transfer. The authors have systematically examined, compared and evaluated many different methods of processing and analyzing genotyping data with regard to quality aspects.In addition to the book, the TMF provides a software tool and various work materials that can be downloaded in the product area of the TMF website. The development and placing on the market of medical devices are governed by a matrix of legal regulations and standards. These rules stipulate what development phases are necessary and what objective evidence documents have to be produced with regard to the suitability, safety, and performance of the product if it is to be tested on human beings and ultimately brought into circulation.The book provides an introduction to the regulatory framework concerning medical device development and explains concisely the relevant regulatory terms such as clinical evaluation, clinical trial, clinical studies, and Health Technology Assessment. The terms must be internalized by all the parties involved and be accorded the same level of attention in the development process as the purely technical and medical product requirements from the viewpoint of users or the market. In this book, medical device developers will find support for regulatory classification of their products and definition of the necessary development steps, depending on the relevant risk class and intended use. Along the entire process chain the book provides practical aids in the form of checklists, decision trees, Reporting Guidelines, and SOP lists with commentaries. Patient care and medical research are constantly generating knowledge, data, results, services, and products, the value of which is often difficult to estimate. Data from patient care is made available for research just as, vice versa, results of medical research are incorporated in patient care.Mutual data transfer is impaired not only by differing data standards and often non-standardized IT infrastructures but also by unclarified legal issues. Consequently, it is often not clear whether results are legally protected, what regulations apply to them, which persons involved hold the various rights, and how the latter can be transferred.This expert opinion examines the value creation process in which added value is created at various stages with considerable effort and input of resources. In this context the focus is on utilization law issues, while data protection law issues are dealt with in numerous other TMF publications.This volume in the TMF book series systematically presents potentially protected objects, such as individual items of data, data collections, studies, computer software, or inventions, and the various protection concepts, ranging from copyright law to contract law. The authors explain in detail issues that are encountered by involved patients, doctors, and research networks. They integrate the conclusions into specific recommendations and information about how to draft contracts. The book is rounded off by specimen contracts. Biobanking is regarded as a much sought-after international key resource for research on the complex molecular mechanisms involved in the pathophysiology of diseases with hereditary components. In order to ensure that these valuable material collections can be used by the science community in the long term, general guidelines on organization and quality assurance for biobanking establishment and operation were developed within the TMF as part of a comprehensive biobanking project. Following the publication in 2006 of a legal expert opinion on biobanking development and operation, the fifth volume of the TMF book series now provides the research community with an implementation guide that assists the user in both the development of a new quality management system and the customization of an existing system. The value of disease-related scientific cohort trials and registers as developed by medical competence networks and other medical research networks depends, for the most part, on the quality of the data they record. However, determining the quality of data in cohort trials and registers is far from easy and is therefore often not precisely known. This guideline contains recommendations on managing the data quality of registers and cohort trials. Quality indicators are described and made available for these checklists. As such, it is an important part of the varied expedient measures for improving and assuring the quality of data in medical research. A key component in ensuring the legal certainty of the collection, processing and use of pseudonymized patient data in trials and research projects is informed consent. This, in turn, places great demands on the information content and unambiguous documentation of the patient’s consent with respect to the particular project. When drawing up patient information and declarations of informed consent, medical, ethical and statutory data protection requirements must be met. The third volume in the TMF book series is a work of reference that enables users to develop patient information and declarations of informed consent on the basis of relevant, documented and commented sources that meet regulatory requirements. Large-scale development and operation of biobanking is becoming increasingly important: material banks that make samples available for medical scientific analysis in the long term, offer major potential for clarifying pressing medical research issues. This is particularly true if the samples are merged with data on the progress of the disease in individual patients. Increased networking in the field of biomedical research is leading to the creation of comprehensive data and sample collections. This, however, poses numerous legal and organizational questions for which in Germany there are no clear regulations to date. The TMF picked up these issues and provided answers to many questions in an interdisciplinary project. These answers were been made available to researchers in the form of action checklists and specimen texts. This second volume of the TMF book series examines the legal framework for biobanking development and operation from a juridical perspective. One of the biggest challenges faced by medical research is conducting clinical trials on large patient groups over lengthy periods of time. The strict data protection legislation in Germany that has evolved over the course of time frequently does not allow the pooling of patient-related data, which is necessary in this context. The TMF’s "Generic data protection solutions for medical research networks" help negotiate a major hurdle in the field of medical scientific cooperation. They make it possible to sustainably optimize a flow of information from the hospital to the scientific world and from here to patient care. Their application means that no expensive specially developed structures are required for ensuring data protection.